Invasion of the Body Snatchers begins with a reunion. When Becky Driscoll comes knocking at Dr Miles Bennell’s door it is a pleasant surprise. He hasn’t seen Becky for several years. But when his visitor bursts into tears he can only sit and listen. Becky is worried about her cousin Wilma who has started to believe that her father is not her father at all. He looks like Becky’s Uncle Ira and he sounds like Uncle Ira. He is Uncle Ira in every way possible, except that Wilma is convinced that he is not and Becky wants Miles to come and convince her cousin that if it looks like Ira and it sounds like Ira then it must be Ira. Miles has lived in the small town of Mill Valley all of his life, he knows Ira Lentz very well and the old man that he sees working in the Lentz garden later that evening certainly looks and sounds like Ira to him. Convincing Wilma of this, however, proves to be a harder task than expected and in the end he refers Wilma to his friend Manfred Kaufman who is a psychiatrist and therefore probably better equipped to handle the problem. When Miles arrives at his office the next morning his first patient tells him that her husband is not her husband. Again Miles can only refer his patient to Manny Kaufman and as the week progresses he finds that he is referring more and more patients and it seems that all is not well in Mill Valley. Invasion of the Body Snatchers belongs to the science-fiction and horror genres, but as with a lot of stories there is also an element of romance. In this case, the will they/won’t they get together question concerns, as you might expect, Miles and Becky. They dated when they were younger, but their relationship fizzled out. Now though, they have something else in common other than their past history: they are both recently divorced. 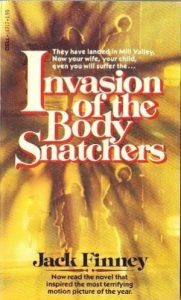 Invasion of the Body Snatchers reminds of The Stepford Wives because both books are set in communities where sinister changes are taking place. They are very different stories but in both books the characters friends and/or family become strangers wearing a loved one’s face. And that is an unnerving idea! It scares me anyway. Invasion of the Body Snatchers is not a very long book. My copy was just 219 pages long, I read it in a couple of sittings and enjoyed it very much. At the time of writing this review there have been, as far as I know, four films based on the book. All of them were pretty successful. That should give you an idea how good the story is.